It is officially autumn, and although the weather has not yet turned chilly in our part of the country, I’ve already started thinking about our winter soup kitchen. 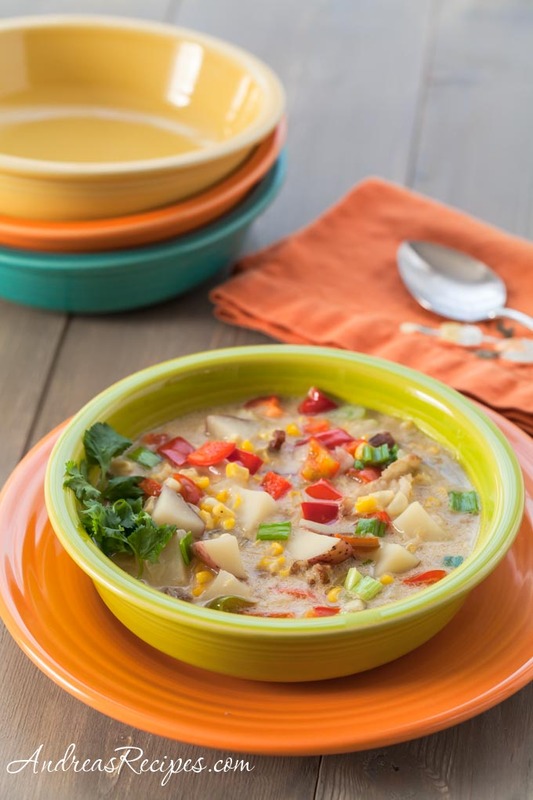 I love creamy soups, and this corn chowder adapted from The New Basics cookbook is no exception. It’s loaded with corn and potatoes, and the flavor is brightened with the addition of chopped red bell pepper and cilantro garnish. We enjoy this with a nice crusty loaf of bread or oyster crackers. Adapted from The New Basics Cookbook, by Sheila Lukins and Julee Rosso. In the large pot, cook the bacon over low heat until the fat renders. You don’t want to brown the bacon, just cook it until it “sweats,” about 5 minutes. Add the butter and melt it. Add the onions and continue cooking over low heat until the onions are shiny and soft, about 10 minutes. Add the flour and cook stirring until the flour absorbs all of the bacon and butter fat, about 5 minutes. Add the chicken stock and potatoes. Increase the heat to medium, cover, and cook until the potatoes are fork tender, about 20 minutes. (Optional: Run half of the corn kernels through the food processor for about 30 seconds.) Reduce the heat back to low. Add the half and half, corn kernels, processed corn, black pepper, and salt. Cook about 20 minutes, stirring occasionally. Stir in the bell pepper and the scallions, and cook 5 more minutes. The peppers will still have some of their crunch. Serve in soup bowls and garnish with cilantro leaves. You can use either fresh or frozen corn. If you use fresh corn, choose ears with kernels that burst open with milk when you press on them with your fingernail. Avoid ears with wrinkled or dry kernels. Use a sharp knife to remove the kernels from the cob. Stand the ear vertically in a shallow pan and cut straight down allowing the kernels to fall into the pan. Then use the dull side of the knife to scrape the cob and extract the remaining milk. Leave the kernels whole for more crunch, or run half of them through a food processor to make the soup even more creamy. This is also a great technique for boosting the creaminess of the soup if you use milk instead of half and half.